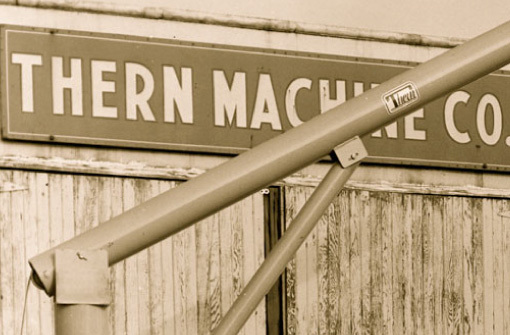 Thern Winches & Cranes : Our History | Thern, Inc. Founded in Winona, Minnesota by the mechanically inclined Royal G. Thern and his wife, Lucille, during the post World War II boom, Thern Incorporated began with a handful of basic winches and other miscellaneous tools. After the war, Royal and Lucille settled in the small, flourishing town of Winona on the banks of the Mississippi river where they created a corn sheller, lever operated chain hoist, cordwood saw frame and a differential chain hoist. These innovative products were the foundation for the lifting, pulling and positioning solutions the company manufactures today. More than seventy years later, Thern has built a solid reputation for manufacturing the most dependable, powerful and durable solutions for moving loads of all sizes. Our extensive selection of off-the-shelf models and ability to design custom solutions, is why customers in markets around the world choose Thern winches and cranes for applications around the world.